Although there are many publishing houses in the world that cater for comic book fans, there is no denying that Marvel and DC Comics are the internationally dominating headline acts. Few other companies have been able to produce such well-known, world-famous characters- ones who have survived for decades, inspired generations of young and old fans, and still remain relevant to society. Without the transition from comic book to television to film, it’s difficult to say whether their reach would be as strong today as it was when they were first conceived, but comic book superheroes have certainly made their mark in mainstream pop culture, and there are no signs of this waning. One of the people most instrumental in this comic book phenomenon is the illustrious Stan Lee- the man behind some of Marvel’s most iconic figures. 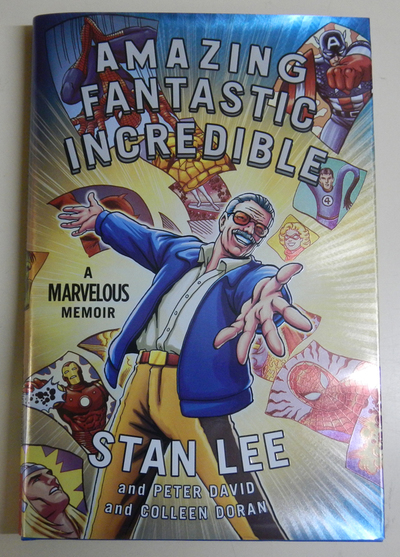 If it wasn’t for the imagination of this once-impoverished, self-confessed storyteller, the world would never have known the likes of Spider-Man, The Incredible Hulk, The X-Men, The Fantastic Four, Ant Man, The Avengers, or any of the other Marvel superheroes we have come to know and love. Known as much for the cameo appearances he makes in the Marvel films as for his outrageous personality, Lee is beloved all over the world. His creations have helped Marvel (and comic books in general) to reach obscene levels of popularity, and have turned the Marvel franchise into one of the most popular in the world. But while his stories are recognised universally, Lee’s own personal story isn’t as well known, which is why he has released his memoirs (set out fittingly in comic book format). With the help of writer Peter David and artist Colleen Doran, Lee has provided an account of his life as a young boy living during the Depression Era to his progression within the publishing industry. Granted several chances to move through the ranks, Lee gradually got to the top tier of the company which is now known as Marvel- having created and written stories about the extremely popular aforementioned characters. Along the way, he introduces some of the key people who helped in his meteoric rise to comic book stardom, including some of the incredible artists and writers he has worked with over the years and who helped to shape the characters into the ones that we recognise today. He talks about his family life and his growth as a person, his triumphs and his frustrations. But most of all, he paints a picture of the man behind the ink- the man who has inspired generations of people to fall in love with characters who are powerful but flawed. This book is entertaining in its content and clever in its presentation- not that you’d expect anything less from a person who prides himself on his forward-thinking and generation-spanning imagination.